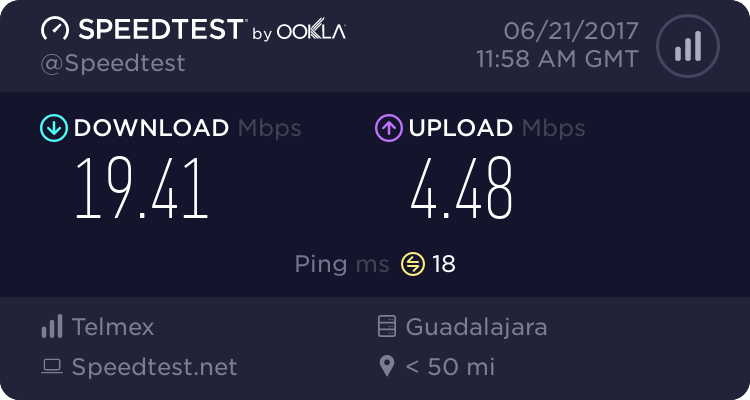 On another thread we briefly discussed TelCel internet speeds when using your phone as a hotspot. Someone said they got terrific speeds. I am currently using my phone as a hotspot (due to brownout in Ajijic) so I thought I would do a test. 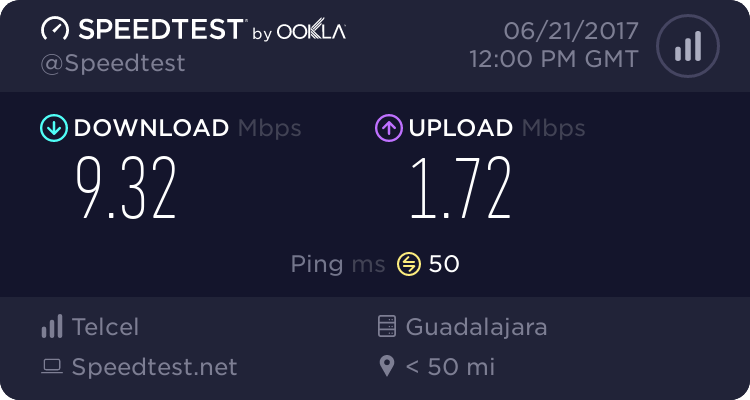 My TelCel download speed is really poor compared to my TelMex which is regularly 10+ MB/S however the upload speed is way faster on the TelCel. Notice that it still shows TelMex as the ISP provider. I would be interested in seeing what others are getting. Can you move my post over here? Or do you want me to do the two tests again and post here? You would have to do it again. I can't cut and add specific posts. This is the exact opposite of what was happening last October and has even gotten worse since 7:30 a.m.
Been trying for a half hour to get a Ookla reading on TMex and I can't even get past "selecting best server"! However, TCel is 5.7 up and .7 down. Can someone save me the googling and outline the costs, etc. 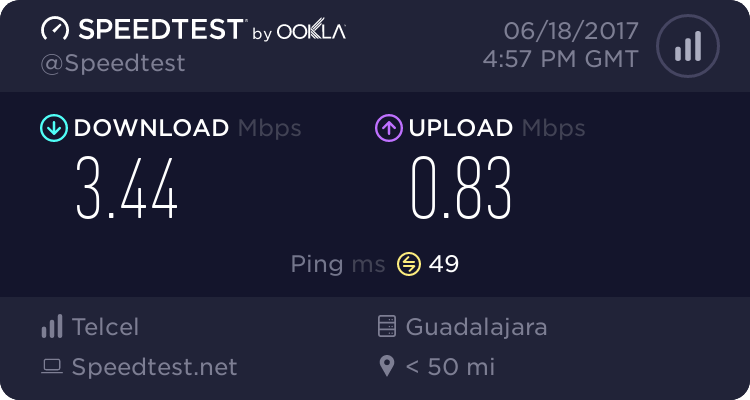 for TelCel Internet? It would all depend on your plan. In my case, I don't have a plan so data usage just comes off my prepaid amount on hand. If you like to download movies or stream video/ Netflix etc. Telcel would be very expensive as a means to do that. Axixic wrote: Can someone save me the googling and outline the costs, etc. 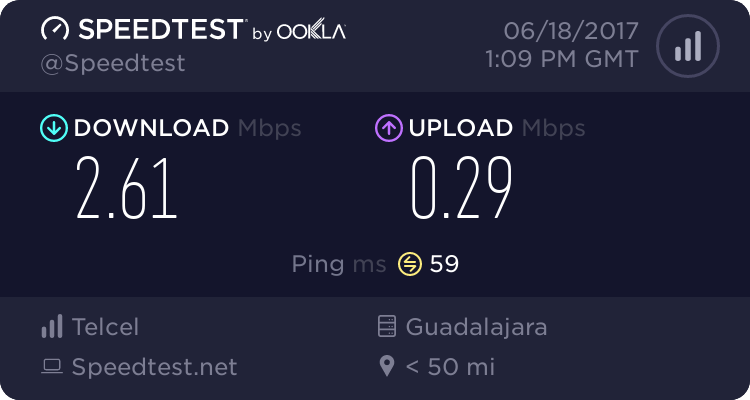 for TelCel Internet? Are you referring to cell phone internet or mobile wifi device which is not a phone and is only for internet connection with computer? Yes, the latter. I am looking at alternatives to Telmex. For one reason or another, the Alcatel 4 was the best choice for my friends in Rancho Alegre... and it is around 2800 pesos outright purchase. To make the best choice of plans, an idea of your consumption would be a good idea. I've been using https://www.glasswire.com/ which was recommended by Mike the Computer Guy. I'm only good for a couple of good ideas a month, so I'm interested in what you guys do for more good ideas. Maybe this will help Axixic as well. FOR INTERNET AND WIFI: I have TelMex 389 plan, landline and internet which is at best 5 in SAT. However, I pretty much only use it for a wifi dock and word processing. FOR INTERNET SURFING, MOVIES, MUSIC, TV, BOOKS ETC: I use a tablet - Kindle Fire 10" with lots of speed and power. Am contemplating a Bluetooth keyboard for the tablet. FOR SMART PHONE AND MUSIC: I use TelCel pay as you go for about 100 pesos every other month and Spodify free. I also use a Bluetooth speaker with killer-great sound for the music. FOR CDs: I'm currently shopping for a Bluetooth CD player that will talk to the speaker. FOR DVDs: TV monitor and DVD player - which will also talk to the Bluetooth speaker. All this costs 439 pesos/mo or ~ 24.38/mo US. The slow speed many of you are getting over Telcel amazes me. Are you devices able to get not 3G but 4G. When I set my iPhone to 4G and use it as a hot spot, I'm getting way higher than 20 Mb/sec down and I don't remember the upload speed. 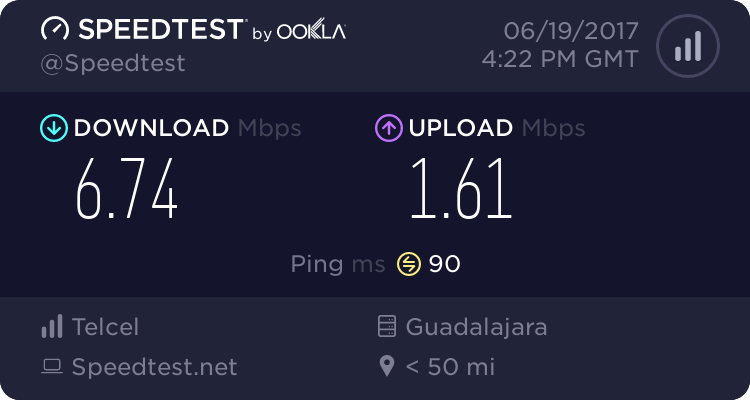 And being on the basic Telcel Amigo plan even doing the speed test costs more than 10 pesos. I therefore set my speed settings at 3G. Sorry I can not do a speed check up here south of Vancouver BC, but assuming that the rainy season is not over, I will come back to paradise as soon as the rainy season starts. Are you going to have another contest to determine when the real rainy season starts or did it already start, I sure thought it had last week. 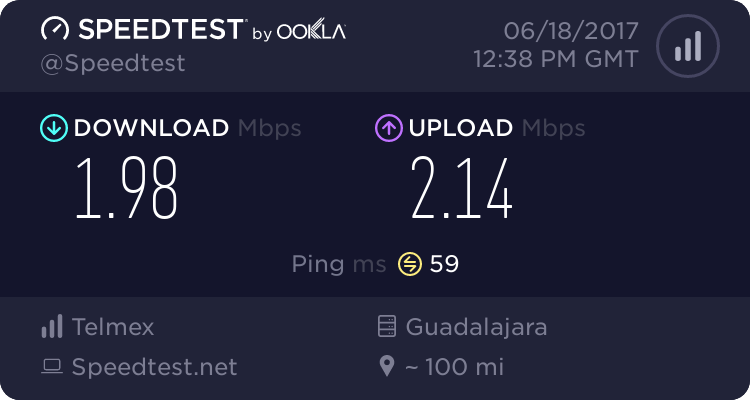 I still don't know what's going on with Telcel since last October, I was getting 30 mbps down. Oh to be a fly on the wall at Telcel. It's the same antenna as last October Pete. Then either the antenna is no longer sending out 4G or it could be your phone, maybe you need to go into your phone and check your cellular data settings or maybe something is wrong with your phone. There are so many things it could be. You might want to check at the Telcel office in the Laguna mall to see what antennas are 4G and once you find one determine whether its your phone or not. Ferret: I am terribly jealous of your Telmel speed. That is great. Who cares if my 4G Telcel may be faster than your Telmex or Telcel speed. 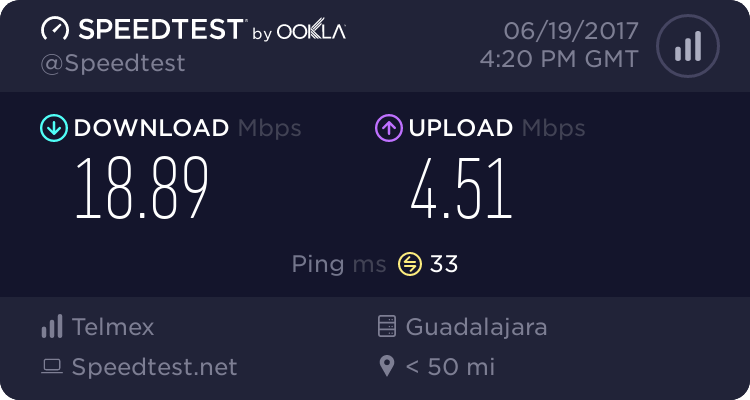 You are only paying (most likely) $599 pesos per month for unlimited internet use. With Telcel 4G as a hot spot reception via my iPhone for my laptop, I would pay many thousand of pesos more for the same volume of data I would use, than if I had your Telmex speeds for only $599. 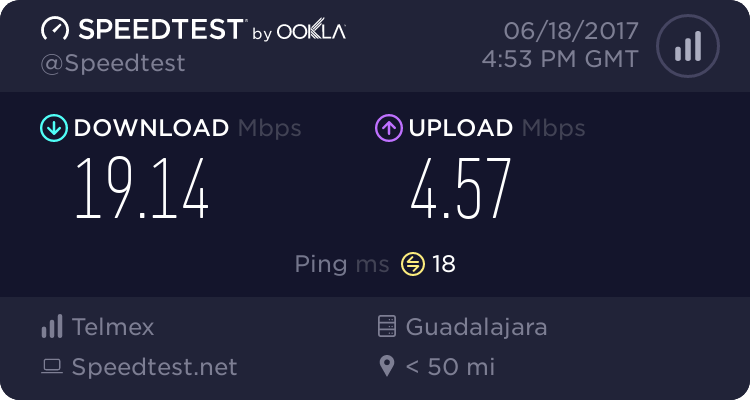 I am in Seattle right now, so I can not show you a real reading in Mexico, But with Telmex the fastest I can get where I live in upper Ajijic is almost 10 Mb/sec down by 0.5 up. I am very happy for you and can hardly wait until we get the same in my neighborhood. I am more than pleased with my current Telmex speed. Hell, I was pleased as punch with 10 down and 1 up and consistency. For 599 pesos, I have phone with unlimited calls to just about anywhere and unlimited internet from Telmex. I download all my shows for free so I can watch them when I want and have an hdmi cord going from my laptop to the TV which also serves to listen to either free online radio stations or my own music collection which I have on my computer. The sound on the TV is wonderful. Because the HDMI is always connected, I don't have to listen to any sound coming from the computer... including bings, bongs and news videos. BTW, when there is no power, connecting with your cellphone is easy. When your power is ON, you must disconnect from your landline connection on your computer and then connect using your iPhone to really test the speed that your cell phone's hotspot is providing. I'm going to stop posting my connections now since nobody else is taking part. Suerte a todos! I am pleased with my consistent 10 MB/S down speed with my Telmex $389 plan too. Rarely is it down. I stream Netflix and do all sorts of web work with no delays or interruptions. Upload speeds are a bit slow but I hardly ever upload any large files or videos.